Wild rice floats on a lake in northern Minnesota. It’s the latest chapter in a years-long saga centering on the impact of sulfate on manoomin–treasured as the state grain, a food sacred to Ojibwe and Dakota people, and a key element in waterfowl habitat. Tribal officials have participated in state efforts, but they have been frustrated at what they experience as state players ignoring their expertise and concern. It is based largely on observations by John Moyle, a researcher with the Minnesota Department of Conservation, precursor to the Department of Natural Resources (DNR). In the Journal of Wildlife Management, July 1944, Moyle reported finding very few wild rice stands in water containing more than 10 milligrams/liter of sulfate. Sulfate is a naturally-occurring substance that is also produced as a byproduct of industrial processes such as mining and wastewater treatment. The rule has virtually never been enforced. Tribal and environmental groups began pressuring the state to begin enforcing it, business groups resisted, and in 2011 the legislature directed the Minnesota Pollution Control Agency (MPCA) to study the matter in depth. That research showed that bacteria in the sediment convert sulfate into sulfide, which gradually diminishes healthy stands. But it also revealed a complication: some waters, high in iron, seemed to mitigate the impact of sulfate. So the MPCA proposed to create an equation based on water chemistry, which would yield different standards for each body of water. An administrative law judge ruled that the agency’s proposal violated parts of the Clean Water Act, failed to meet legal standards, and was unconstitutionally vague. In May, 2018, the MPCA withdrew its proposed rules. “Although the science is accurate, when it comes to how best to apply the science and affordably implement the rule, we still have more work to do,” then-Commissioner John Linc Stine said in a news release. Governor Dayton appointed a task force comprised of representatives from tribal nations, industry, labor, environmental groups, scientists, state government agencies, and other stakeholders. A major stumble occurred when the Minnesota Chippewa Tribe (MCT) asked for a spot on the task force for each of its six-member bands. The administration pointed to the legislation creating the task force, which limited it to fifteen members; it allotted one seat to the Dakota tribes and one seat to the Red Lake Nation, which is not a member of the MCT. The MCT responded that this answer disrespected the sovereignty of the eleven federally-recognized tribes in Minnesota, minimized tribal knowledge and understanding of wild rice, and ignored the disproportionate effect of dwindling wild rice on native people. The tribe declined to participate and instead set up its own Tribal Wild Rice Task Force. The Dayton task force met during the fall of 2018 and issued its final 87-page report on January 3, 2019. Unable over three months to resolve the thorny issues the MPCA has grappled with for more than ten years, the group recommended establishment of yet another advisory body, this one to be called a Wild Rice Stewardship Council. Perhaps having learned from its experience, the task force recommends that all eleven federally recognized tribes in Minnesota should be invited to have representation in this new and permanent body. Its responsibilities should include: recommending a statewide wild rice monitoring and management plan, fostering research on wild rice, advising on statewide outreach and education, and developing a roadmap for protecting wild rice from sulfate. Further recommendations include: a law requiring the state to consult with tribes and funding for at least one full-time tribal liaison; guidance from the MPCA on how permit holders can minimize sulfate in their discharges; funding to help wastewater treatment plants meet requirements; and an improved variance process. A variance is temporary permission to exceed a normal standard. U.S. Steel’s giant Minntac mine. Taconite mines have been unable to meet the sulfate standard for wild rice waters. The report notes that “Permittees find the process expensive (including the cost to apply for a variance, consulting fees, and staff time), that it takes too long to go through the process and receive the variance, and that once granted it is burdensome to implement the requirements of the variance.” It describes steps that MPCA has already taken to make the process easier for permittees. Two final recommendations are that Minnesota and tribes should declare the first week of September to be Wild Rice week to improve awareness of the value of wild rice, and that “The Legislature should appropriate adequate resources to achieve the above recommendations.” No particular timeline is suggested. The report includes a chronology of events related to wild rice, beginning “over 2,000 years ago” as indigenous people harvested and cooked wild rice, and noting that “American Indians managed the wild rice to ensure there was enough to sustain their needs, the needs of wildlife, and reseed for future years.” It points out such management activities continue today. The Minnesota Chippewa Tribe Task Force consisted of representatives from all six member bands of the Tribe, plus representatives from the Prairie Island and Lower Sioux Dakota communities, and the 1854 Treaty Authority. They completed a report and released it concurrently with the report from the Governor’s Task Force. The 74-page Tribal Wild Rice Task Force Report explains the importance of wild rice to tribal people, calls on the state to respect tribal expertise and concerns, and urges the state to enforce the existing rule, rather than looking for alternatives. It analyzes monitoring data from streams all over Minnesota, concluding that three-quarters of the streams in the northeastern part of the state already meet the current standard. 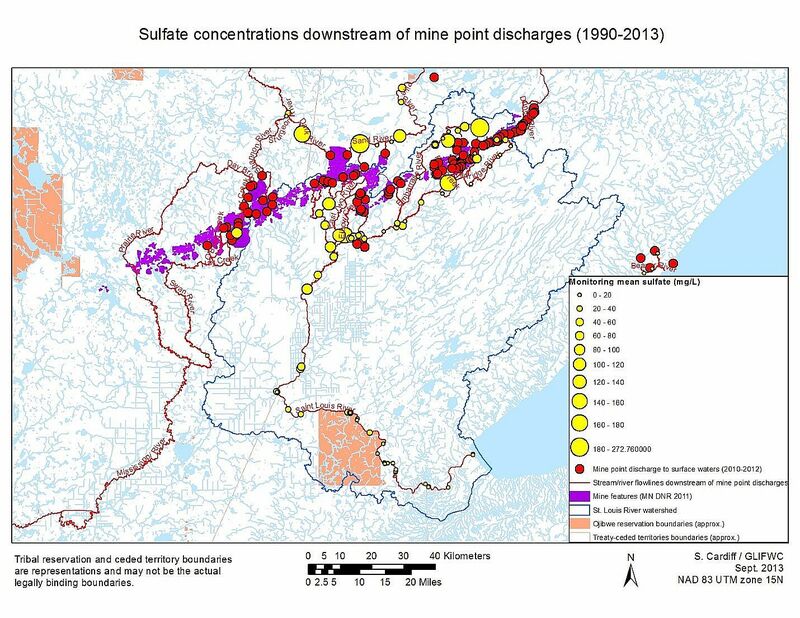 Maps show sulfate hotspots, generally just downstream from the discharge pipes of electric power plants, taconite mines, and to a lesser degree wastewater treatment plants. For example, the giant taconite plant Minntac discharges water with a concentration of 1054 milligrams/liter into Little Sandy Lake. Minnesota Power’s big Boswell Energy plant discharges are at 586 milligrams/liter into Blackwater Lake. Several times in the last few years the legislature has passed bills to protect industry from enforcement of the 10 mg/liter standard, responding to claims that such enforcement would make taconite mines uncompetitive and could strain local communities whose wastewater treatment plants slightly exceed the standard. The Tribal Task Force report also alleges the MPCA uses a “reduced standard of oversight” for taconite mines and power plants compared to wastewater treatment plants and other industrial dischargers. The mines and power plants more frequently operate under outdated permits than other categories of dischargers do. The agency proposed an updated permit for Minntac late in 2018; its original permit had expired in 1992. The Fond du Lac Band and the environmental group Water Legacy, joined by the Grand Portage Band in an amicus brief, are challenging that permit in court; meanwhile, the MPCA is fighting a years-long legal battle with Minntac’s owner, U.S. Steel. Another important consideration for the tribes is designating which bodies of water will be given protections for wild rice. In 2008, the Minnesota Department of Natural Resources created a master list of wild rice waters and recommended that the list be updated periodically. The MPCA favors a restrictive definition, requiring wild rice stands to be at least two acres in size, which would exclude many of the waters in the DNR list. The tribal report calls for a much more expansive definition. “From a tribal view, all waters are connected and have importance,” it asserts. “Colonization of Minnesota has changed the hydrology of the area with dams and culverts and what once were ‘rice waters’ have changed and new areas now hold wild rice. With the continued exacerbation of climate change it is difficult to predict what waters will continue to hold rice, or what water will need to hold rice for culture and customs to continue. With that in mind, if a lake or river supports, has supported, or could support any wild rice, it is a wild rice water. We do not see any other way to define it.” Many factors can affect how well a stand grows: natural cycles, water levels, weather events, runoff and development can have dramatic effects on stands. The report points out that most of eastern North American formerly had rich wild rice beds; the stands in Minnesota represent the remnants of a once common resource. Tribes don’t even think the MPCA has properly classified the waters where wild rice grows. Historically it was placed in Class 4 waters, which are used for agriculture and wildlife. The tribes think it belongs more properly in Class 2, which aims for “fishable, swimmable” water quality. Trout and other fisheries appear in Class 2 waters; their presence indicates high water quality and habitat, and tribes say this describes wild rice also. The tribal report also recommends creation of a comprehensive program to monitor, map, and assess the potential of each water body to support wild rice. Tribal groups have already begun this long-term study, documenting long-term declines, and they want the state to join in, with adequate long-term funding. Like the state task force report, the tribal report also recommends research and investment in treatment technologies to reduce sulfate. In concert with the tribal wild rice report, the Fond du Lac Band is revising its water quality standards. It sounds like a routine bureaucratic function, but it’s another tool in the campaign to force Minnesota and the federal government to do a better job of protecting the natural resources of ceded lands in northeastern Minnesota. The document emphasizes the band’s status as a sovereign government in charge of protecting its own waters, giving it the right to ask other governments—state and federal—to enforce clean water standards upstream from the reservation. The St. Louis River and its tributaries flow through the Iron Range mining district, where they pick up pollutants and carry them downstream to the reservation west of Cloquet. The Clean Water Act requires that all government entities should ensure that their regulations enable other governments downstream to attain their own water quality standards. At a gathering at Fond du Lac Tribal and Community College in November, the band’s Water Protection Coordinator, Nancy Schuldt, said, “Our authority applies to reservation waters, but the St. Louis River connects us to upstream, and that’s strong ammunition” to hold state and federal agencies accountable. One of the new features of the revised standards is a numeric standard for specific conductivity (SC). Conductivity is the ability of a material to conduct electrical current. Related to salinity, it’s a useful indicator of water quality. A natural lake or river has specific conductance that supports life, but higher levels can have negative effects. Specific conductance is measured in microSiemens per centimeter (uS/cm). The federal Environmental Protection Agency (EPA) recently analyzed specific conductance in Appalachian waters; that study showed that higher salinity causes streams to lose insects, crayfish, and other aquatic animals. The result was a benchmark of 300 microSiemens/cm, above which 5% of macroinvertebrate genera are extirpated from streams, generally regarded as an unacceptable level of pollution. In a study supporting the band’s revisions, Bruce L. Johnson and Maureen K. Johnson studied northeastern Minnesota waters and concluded this benchmark could usefully apply in this region as well. Earlier research paints a similar picture: a 2006 study conducted by MN DNR Fisheries, Fond du Lac, and the 1954 Treaty Authority found that upper reaches of the St. Louis River had a mean SC of 59 uS/cm, while the segment impacted by mining had a mean of 260 uS/cm. A follow-up study by the EPA’s Region V confirmed these findings. “Overall, the weight of evidence supports the inference that effluents that increase waterbody SC to more than 300μS/cm have adverse effects in northeast Minnesota waters,” according to the EPA review. Accordingly, new language in the FDL water quality standards calls for specific conductance to be kept below 300 uS/cm to protect aquatic life. Minnesota doesn’t have a SC standard to protect aquatic life; the state’s limit is 1,000 uS/cm, designed to keep water used for irrigation at acceptable levels of salinity. In response to a January 24, 2019 inquiry from Agate, the MPCA’s Assistant Commissioner for Water Policy, Shannon Lotthammer, said it’s impossible to predict in general what the state would need to do to accomplish this lower level downstream in the St. Louis River system; the answer “depends on the specifics of the waterbody including natural background water quality, existing water quality, stream flow or lake residence time, and the presence and nature of any upstream discharges (point source and nonpoint source),” Lotthammer said. The Fond du Lac Band also conducted a Health Impact Assessment (HIA) in response to the state’s plan to change its sulfate standard for wild rice waters. Like an Environmental Impact Statement, a HIA is a process that helps evaluate the potential health effects of a project before it is implemented. The band worked with other agencies including the Minnesota Department of Health, the DNR, MPCA, and EPA to produce the 68-page document, available by searching the band’s website. It describes the centrality of manoomin to the health of the Ojibwe people. It recounts the Anishinaabe tradition that, based on prophecies of the arrival of Europeans in North America, the people migrated westward until they found the “food that grew up out of the water.” Here they established a new homeland, and today they still depend on this highly nutritious food as a “dietary staple for the Ojibwe people, as much medicine as it is food, with cultural and spiritual importance and a necessary offering at community feasts and ceremonies… Manoomin is the first solid food given to Ojibwe infants, and is the last food offered to those who have passed, to carry them on their journey,” according to the HIA. It also expands on the importance of the 19th century treaties in which tribes reserved the right to hunt, fish, and harvest natural resources on the land they ceded to the United States. That land includes most of northeastern Minnesota. The U.S. Supreme Court has affirmed those rights, and they give the bands a “direct interest in the protection and proper management of the natural resources on which those rights depend,” says the HIA. It has long been recognized that Native Americans experience disproportionately high levels of many serious health problems, including but not limited to heart disease, obesity, high blood pressure, cholesterol, and diabetes. The HIA connects these problems to the historical forced relocations and efforts to assimilate tribal people, and the resultant substitution of high-fat commodity foods for traditionally healthy diets and lifestyles. In contrast, wild rice is a positive force for health. Not technically rice, it is a gluten-free cereal, with more protein and dietary fiber than white or brown rice, and higher levels of omega-3 fatty acids and vitamin B. Harvesting the food requires physical effort. And the harvest and associated activities promote social engagement, an important factor in mental health. Rice also contributes to food security and approximately $19.2 million in annual income for manoomin harvesters, supporting nearly 300 jobs. The HIA recommendations include promoting wild rice among specific groups, labeling natural, hand-harvested wild rice as distinct from paddy-grown rice, and pressing the state and federal governments to take into account the basic need for clean, healthy ecosystems. Responding to a query from Agate, U.S. Steel spokeswoman Meghan Cox said in an email on January 30, 2019 that all stakeholders should have a voice, that U.S. Steel believes in sound science and inclusion, and that the task force enabled a lot of information-sharing. “We were encouraged that task force members were able to pivot away from a strict focus on sulfate to a recognition that there are multiple factors that need to be evaluated if you truly want to protect and restore rice,” Cox said. The Environmental Quality Board, the office which prepared the Governor’s Task Force report, is briefing agency leadership and new administration staffers on the issues, but according to the EQB’s Katie Pratt, there is no specific path forward yet.